Beard Covers Case of 1000. White disposable beard covers. 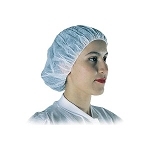 Sanitary nets to help keep hair and sweat from contaminating work areas. Size: 18" length. Polypropylene (PP). Elastic edges. Dual earloop straps. 10 bags of 100 pieces each per case. Made in China.